When I ask which models come to mind when you hear the words ‘motorcycle GPS’, what do you say? Probably Garmin Zumo or TomTom Rider? Well there are a lot of motorcycle owners that use a Garmin Nuvi or Garmin Drive GPS on their motorcycle. This article discusses the advantages and disadvantages of using a Garmin Nuvi or Garmin Drive GPS on a motorcycle, and how to do that. 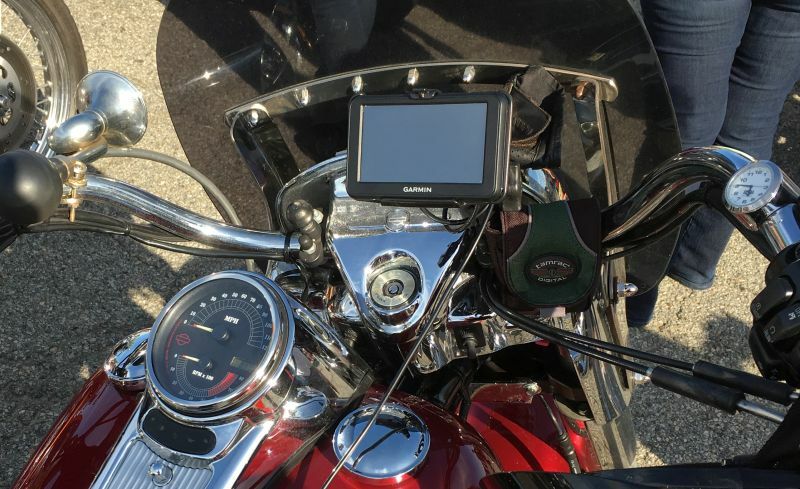 The photo that accompanies this article is of a Garmin Nuvi 2455LMT on a Harley-Davidson. Yup, a car GPS on a motorcycle. So what’s the difference between your everyday Garmin Nuvi / Drive car GPS and a Garmin Zumo? Besides a significant price difference, there’s a few notable things to consider. For purposes of this article, understand that the Garmin Nuvi was renamed to a Garmin Drive in 2016, but I’ll refer to them as a Garmin Nuvi. That’s what everyone is used to. The Garmin Zumo line was introduced roughly ten years ago. While there have been added software and hardware features over the past decade, the premise has remained the same. A Garmin Zumo is made for rugged use in a high vibration environment. The screens are glove friendly meaning that the display is sensitive to being touched with a hand that is wearing a glove. Lastly, and probably more importantly, the Garmin Zumo is weatherproof. That means that you don’t need to be overly concerned if it gets a little wet. Now I wouldn’t strap it to a submarine, but you can ride it through light to moderate rain. A Garmin Nuvi GPS is made for use in a car. Now with that said, I know there are thousands of of these in use on a motorcycle and I never heard of the vibrations affecting the GPS. A car GPS isn’t glove friendly. You need a bare hand to interface with the display. Lastly, if it rains, you better stash this in a saddle bag because they aren’t made to get wet. Not at all. There are a few notable accessory differences too. A Garmin Zumo comes with a heavy duty metal motorcycle mount. The RAM Motorcycle Mount for Garmin Zumo is a well made mount that bolts to the back of the cradle that came with the GPS. It’s made to attach your GPS to a motorcycle handlebar or clutch. The Garmin Nuvi comes with a suction cup mount. Do not even think about using this on a motorcycle. Fortunately, RAM has a large variety of mounts to attach a Garmin Nuvi (or Garmin Drive) to a motorcycle. RAM made a lot of custom cradles for each Garmin GPS as they were announced. They stopped doing that over the past few years and instead a lot of newer GPS owners opt for the RAM X-Grip Cradle and Motorcycle Mount for Large Smartphones. This is a great mount for a GPS as well as a smartphone and it even comes with a safety tether. There are also some decent weatherproof cases that attach to handlebar mounts such as the Arkon Weatherproof Case with Handlebar Mount. This mount includes a weatherproof case with a clear lens and cable port to fit GPS units up to 5.5 inches. The included handlebar mount fits up to 1.25 inch diameters. The mount bolts onto the handlebar. The mount comes with a 2-year manufacturer warranty. The Garmin Zumo includes a hardwire attachment that connects the custom cradle to a power source. Most wire it to an accessory outlet or directly to a battery. A Garmin Nuvi is powered by a mini USB connection. A Garmin Zumo cable will not fit the Garmin Nuvi or Garmin Drive. Fortunately there is a Garmin Mini USB Hardwire Cable that allows connection of a Nuvi or Drive GPS to a power source. Get the one from Garmin because it has a fuse on it. Of course, if your motorcycle is already equipped with a DC outlet, just plug your car charger in. Can I Use a Handheld GPS on a Motorcycle?